In 2015, Corning announced "Project Phire," a new material that combines the strength of Gorilla Glass with the scratch-resistance of sapphire, and as of today, the result of that project is ready to launch. 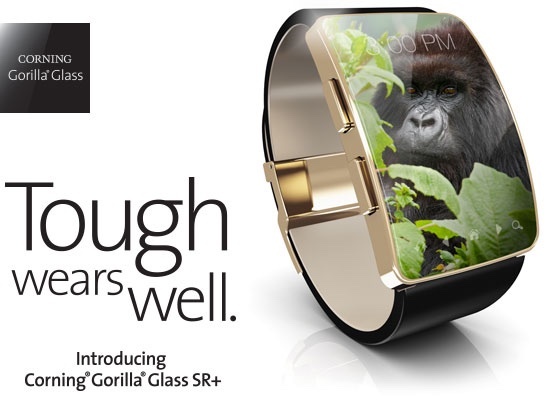 Now called "Gorilla Glass SR+," Corning's latest product is a composite material for wearable devices. It's been designed to cut down on visible scratches while continuing to deliver all of the features of the original Gorilla Glass. According to Corning, Gorilla Glass SR+ offers scratch resistance similar to sapphire but with 70 percent better damage resistance against impacts and 25 percent better surface reflection. Corning says these optical improvements enable better battery life and improved outdoor readability. "In early 2015, Corning launched Project Phire with the goal of engineering glass-based solutions with the scratch resistance approaching luxury cover materials, combined with the superior damage resistance of Gorilla Glass," said Scott Forester, director, innovation products, Corning Gorilla Glass. "Corning Gorilla Glass SR+ delivers a superior combination of properties that is not available in any other material today - it is in a class of its own." Corning is a long-time Apple Supplier, and its Gorilla Glass products have been used in the iPhone and the iPad for several years. For its wearable device, the Apple Watch, Apple currently uses Ion-X glass for the Sport model and sapphire glass for the stainless steel and Edition models. It is not clear if Apple will consider Corning's newest product for any future versions of the Apple Watch, but if it is superior to current technology, it is a possibility. Corning says Gorilla Glass SR+ is now commercially available and is expected to be in products from "leading global brands" starting later this year. That fake watch is a piece of beauty. This is only a guess, but: maybe its because that wearables' screens are relatively small, so its easier getting shatter resistance while maintain "sapphire-like scratch resistance." It's possible that this new glass didn't offer much better drop resistance when made into larger screens. Love the tribute to Harambe. This relationship has always seemed strange to me. Apple won't say that they use GG, and they won't allow Corning to acknowledge GG is used on iProducts. Everyone knows they do, so I don't really see the issue. I've always subscribed to the conspiracy theory that not all iPhones and iPads have GG. Sort of like the Samsung/TSMC chip deal. I don't know, regional maybe. My theory is not without merit. There are 3 main players for ion exchange glass. Two of them, including Corning, are Apple suppliers. While I'm at it, what's with the stupid Ion-X name for the glass on the Apple Watch? It's GG too. Loses its advantages in larger sizes? Quality issues in manufacturing larger panes? Knowing Apple's relationship with Corning, it wouldn't surprise me if this was in the Apple Watch 2 (sport). I went with the Sapphire on the original because I can't stand getting little scratches on my watch face, but I'll be watching this to see how it fairs over time. Ironic that this photo is what the iWatch should've looked like. One of the reasons I ended up selling my Apple Watch, just felt a bit dorky. Looked like something that was maybe futuristic in 2013 or 2014.